Jonny gave us a quick tour and showed us some of the tools decorating the interactive walls. The first wall held a PDF board. Jonny explained that this board can be used for PowerPoint presentations and other media. It showed a project plan which was clearly readable from anywhere in the room. On the next wall a floor to ceiling Trello board beamed back at us, displaying a set of buttons for different boards that were available to the meetingroom team. Jonny explained that his team use these boards to keep track of what they are working on so that any team member can easily dip in and find out what everyone else is doing. He mentioned that project management tool integrations had been requested a lot by the clients they are testing with which is why they decided to add the Trello board to the room. Another wall had an interactive whiteboard mounted. Jonny got quite animated as he explained the interaction that can take place with it and the fact that any drawing you do on it is so easily shareable due to its digital nature. He waved his hand at the board and dividing lines appeared as by magic, accompanied by headers such as "Customer segments" and "Customer Relationships"
The last bit of wall between the 2 windows showed a video of Jonny showcasing his whiteboard app on a mobile device - at times the picture seemed to almost leap out of its frame drawing my eye to it. As a visual oriented creative techie I got very excited when I saw all these interactive tools in one room and imagined all the possibilities that they offer. The real feel of the virtual space. Seems real doesn’t it? Well, it felt pretty real to me. Jonny, Vourneen and I were there in spirit and avatar, but in fact I was sitting in my own comfy office chair behind my desktop at home hiding from the worst snowstorm in Ireland since 1982, while looking at meetingroom.io's latest iteration of their digital collaboration space. The 3d animated room I have just described. View of the virtual space from my desktop while Jonny explains some of the tools in the room. The animation quality of the 3d room was somewhat basic but not annoyingly so. While the head and hands of Vourneen and myself weren't animated, Jonny's avatar while also basic in look was very much alive. His arms and hands were moving around freely and his head was nodding or shaking as he passionately told us about the space. Vourneen was logged in from her laptop, I was logged in from my desktop pc and Jonny was using a Vive VR headset and Sensors at his home. The animation of Jonny's character was the result of a bit of VR tracking magic. Everyone's audio was clearly positioned in 3d space aswell. If I looked around at Vourneen the audio appeared to come straight at me. If Jonny was on my right his voice came from my right, and if I moved away from someone their audio volume dimmed. The sound also changed if Jonny turned around. This really added to the distinct feeling of being in the room and made me more aware when someone was directing their voice to me. Jonny took us back to the table and we got to fire some questions at him about meetingroom.io and it's uses. Q1 Alex: It's clear that there are a lot of potential uses that this digital space could offer but what is the main purpose you see this space used for? Would you just see it replace video conferences and being used for online trainings or do you also envisage people using it as their primary group space to do all their work and replace their real world office? A1 Jonny: There are a lot of potential uses for it indeed. It can be used for ad-hoc meetings and conferences and we use it that way a lot ourselves with the team, but the way we envisage its main use at the moment is for planned work. Think of project meetings that require a lot of interactivity and engagement and where meetingroom.io will allow everyone in the room to participate rather than having the almost scripted and switched off feel that video conferences tend to fall into. So project and product work are some of the main use cases we focus on. These are the types of meetings where it is also very useful if you can see peoples "body language" (VR based interaction) as this really helps you interact. quick clip of how an animated Jonny pointed some things out - note that this is a lot smoother in the product then it looks here (this gif uses a reduced frame rate). Q2 Alex: I really feel a lot more engaged being in the space than I have ever been while on Voice or video Calls. Was this a clear goal for you in developing this product? A2 Jonny: Absolutely, and it really makes a big difference to us to have this space available to our team. To give you an example: this week's major blizzard caused businesses to close their offices allover Ireland. It had a huge impact on productivity across the entire country. It didn't really affect us at meetingroom.io. We could continue to work together and collaborate to reach our goals business and development goals for the week. The fact that we had to stay at home didn't have much impact on our productivity at all. We designed our product to be accessible and reliable above all else. Q3: Vourneen: What is your target market going to be? Are you mainly aiming at large enterprise organisations and corporate entities or are you aiming for a wider audience? A3: Johnny: We're naturally happy to work with enterprises but we're not looking so much at organisations, our focus is more on teams. Rather than focusing on big roll-outs in large companies we'd like to be able to add value to any team that is in need of our kind of collaborative space. We're getting a lot of attention from various B2B teams and SME in general, which underpins that belief. As Meetingroom.io is a SAAS product, scalability is not too big of an issue and the getting started process does not require too much effort on our part, so we see any highly remote team as possible candidates for our closed beta program. That said, were looking to keep a high focus on customer engagement, to really take people through the process of best use and to optimize for their use cases. We want to find out what tools they would like to have added so that we can use their feedback to help drive our development and to identify new integrations. We believe we can really help these teams to come closer together and get more work done, even if they are unable to physically meet. Q4 Vourneen: If a business or team would want to switch over to your product there are of course some requirements in terms of equipment. What do you think the cost would be in terms of the needed headsets /VR and other possible hardware? A4 Jonny: Well the product is usable on many different platforms and this can sometimes also make it a challenge to define what is really needed for the specific needs of an organisation. As an example, we have a large beta client who rolled our product out to some of their teams and they tested the use with IPads. This caused some issues, because when they gave a few pilot users these IPads, everyone in the organisation suddenly decided they needed them. Our software is usable and accessible from many platforms and as such very adaptable, so we're happy to allow people to use it from any platforms they see fit and have available. That said, we are happy to assist and identify what equipment might be needed for each use case. 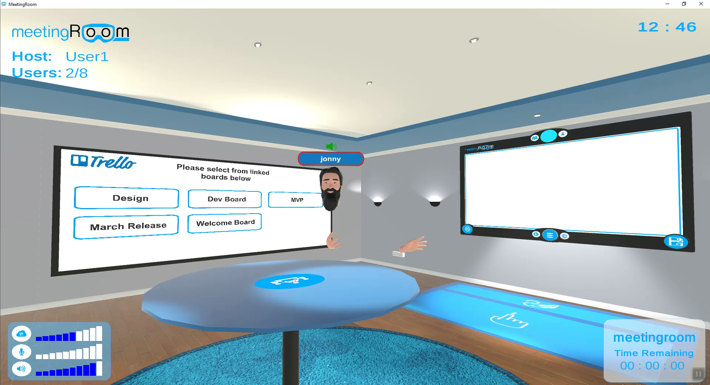 This can be looked at not at team level, but also for individuals and the needs for the specific roles they will fulfill in the virtual room. For many an IPad or even a decent audio headset with their laptop might be enough to get them started but for some VR headset might be a need. There are some great products coming out for VR use, that are completely standalone, such as the Vive Focus for instance. We see that VR headset as a good fit for people that need the VR capabilities out of the box. These headsets are fully functional and standalone, with no need for a laptop or desktop. They will come in at relatively affordable price points (expected to cost between 550 and 650 Euro). We're getting a few of these in for testing at the moment and they should become available for general sale in Europe in the near future. There already are some cost effective VR headsets available for use with Windows PCs and laptops as well. Q5 Vourneen: It's great to see that you are already fleshing out the use cases and possibilities by working with different beta customers. Have you started working out a pricing structure and if so, what do you expect that to look like? A5 Jonny: At the moment we're still working that out, but for our beta customers we are looking to be cost effective as feedback is really important to our development and refinement at this stage. So were looking to have the right clients working with us and to get as much information and many suggestions from them as possible. 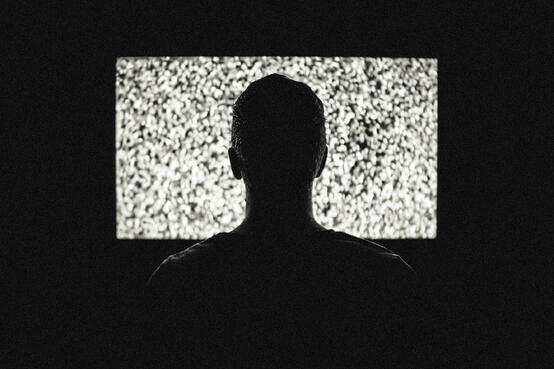 Q6 Alex: In terms of the technology behind the room, I can see a few icons and meters on my screen, of which most are self-explanatory, I also see an icon showing what looks to be bandwidth. Can you tell us a bit about how bandwidth intensive this room is? At this point I did a quick lap around the room while talking - I noticed Jonny looking for me which prompted me to say - "sorry I am just having a quick look around the room while I am talking" - I walked back around to him and my full attention was on him again. Another thing that never happened to me in a remote meeting before..
A6 Jonny: We spent a lot of time to optimize our space to use as little bandwidth as possible and to make it as resilient as we can to drop outs and disconnections. Therefore our meeting room is a lot less bandwidth hungry then many video/audio conferencing apps out there. We have done some bandwidth use comparisons with Skype and found that our service is up to 90% more bandwidth efficient. We have recently started running tests with around 90 people at a big client and apart from the engagement aspects that we already discussed, there was a lot of mention about another big advantage vs their current conferencing solutions. The stability of the connections really added to the experience feeling more real without the interference bandwidth issues. This is also one of the reasons why this room does not look absolutely amazing yet from a graphical point of view. We are first and foremost designing for functionality and graphical presentation comes second to that. The experience needs to be as smooth as it can be on any type of connection. We also want it to work from as many devices as possible no matter the platform or device age. So that's why low bandwidth use is also something that we designed for from the beginning. Q7 Alex: It's great to hear that you really take usability across devices and specifically for mobile and remote users so seriously. So leading on from the bandwidth requirements, how sensitive is your application to disconnections? A7 Jonny: It has been our priority from day one to optimize in such a way that disconnections and any connection driven disruptions are as unnoticeable and painless as possible. This has resulted in a very stable environment. We have had several experiences with very bad quality connections ourselves, even during this week due to the blizzard and they haven't had any major impact on our experiences in the the room, so we are quite happy with the resilience we have built in. We think this a major benefit of our service over the existing video meeting/conferencing services available today. Q8 Alex: Is your software able to use the gyroscopes of mobile devices and can you use extra devices to control different aspects of the presentation options around the room? There are lots of different things that can be done and you can collaborate in different ways from different devices, we develop for usability and each device and platform has its own tech and can be adapted in its own way to add some sort of unique functionality. We are not trying to become just a VR or AR platform. That’s not what this is about. It's all about usability and adaptability. We are even looking into other interactive and animated features in meetings that don't require any VR headsets. Of course we see that VR is going through huge growth and that it might well become as widely used as mobile is today, but we are designing for use now and want to give the possibility to access our space to as many people as possible. The fact that the meeting room was the demo and the demo was the meeting might have something to do with. Or maybe it is Jonny's very clear enthusiasm and energy when he talks about meetingroom.io, but this felt a lot more like an encounter in the real world than I have ever experienced in any video or audio conference. The fact that you can move around the space and huddle In a corner together, the fact that Jonny's movements were way more clearly captured in 3d space than I ever saw on a webcam image of a meeting participant in a video conference. The way that every movement of Jonny's arms was smooth and that the audio in the meeting was spatial and very clear. All these things added to making the experience very immersive and engaged. I was not tempted to direct my attention elsewhere at all during the entire time we were in the virtual room. Add all the possibilities that the interactive walls offer and the fact that using a 3d environment gives you a lot of control over how the space is built, and we can see the potential very clearly. We believe that the scope is nearly limitless for a wide variety of uses. Not least Remote training and sales meetings with far-off clients. 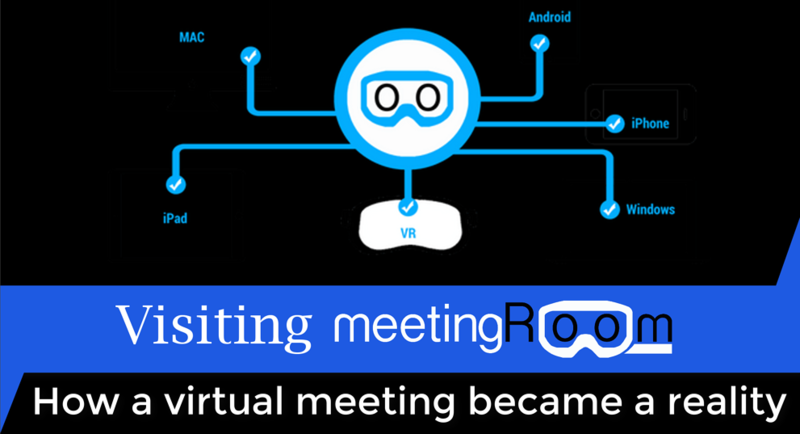 We have already had some hypothetical discussions with our clients about the prospect of using meetingroom.io's virtual space for remote training in the future and found them to be quite interested. This indicates a new readiness in the wider world, or at least in our industry to embrace the idea of transforming meetings to Virtual Reality. We love the focus on usability and adaptability for different platforms, but with so many options and possibilities available for participants, a lot might come to ride on having a great on-boarding strategy. Many people will need to be eased into really understanding the value of the 3d space if they are going to adapt it to its full potential. 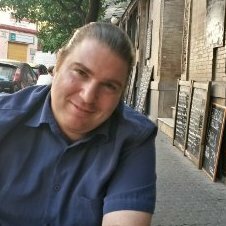 One thing is for sure, we will definitely be closely following how meetingroom.io further develops their virtual space on its path to public release. Looking for remote training or workshops on Inbound principles or marketing strategy?